With Jill Shaw-Feather. 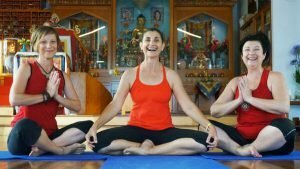 Yoga for all levels and age groups, including seniors and beginners. Includes relaxation and personal instruction. Mindful movement practice to help you unwind from workday stress, let go of tension and feel revitalised. A gentle blend of postures, breathing and Meditation in the hatha yoga style allows you to work to your own capacity. With Amanda Lynn. Yoga for all levels and age groups, this class focuses on helping you find the safest and most effective way to practice. This balanced flowing class develops strength and flexibility allowing you to work to your own capacity, as deeply as you feel comfortable, while at the same time having the opportunity to explore more challenging options.